The rain is gone, but water was still rising Friday afternoon, so flooding remains a concern. Swollen creeks and streams continued to pour more water into the already swollen Potomac River Friday. 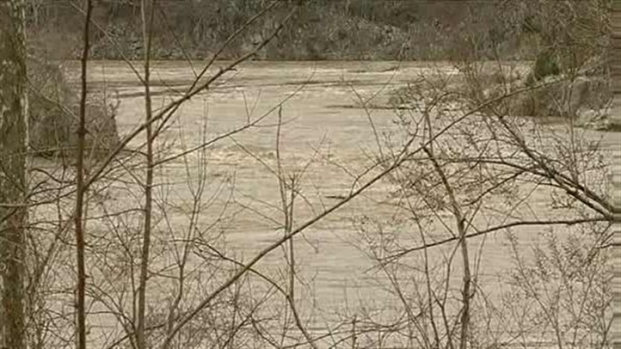 The river is expected to crest at or near flood at about 10 p.m. In D.C., Fire & EMS marines are ready for water rescues if necessary. "It's been a rough couple of day," said D.C. Fire & EMS spokesman Pete Piringer. "We had some extremely high water yesterday, with all the inclement weather, and in fact, here at the fire department boat headquarters, the Marine Division headquarters on water street, the water was about a foot from the top of the pier. Typically it's about 5 or 6 feet." Derrick Ward reports that the flooding dangers along area rivers have not passed yet. Boats had to be moved out from under their covered moorings so that rising waters to push them into the roofs. In Frederick, Md., officials are watching the level of the Monocacy River. "We have a couple road in the county that are actually block off so that people don't try and go through," said Mike Ramsburg, of the Frederick Department of Public Works. "Further up the road here the water's across the road and it's moving rather swift. If someone attempted to go through there they could be in big trouble." Authorities in the area are warning against recreational boating because of the high water and the increased debris in the water. The water at Little Falls, Point of Rocks and Harpers Ferry are expected to rise above flood stage Saturday before receding, so flood warnings are still in effect.